The 2018 Lucas Oil Pro Motocross Championship series is right around the corner. MX Sports just announced the TV package that includes 36 hours of live coverage and more than 70 total hours of action. (See complete press release below) For less than $5 per round using NBC Sports Gold you can see all of the action unfold with exclusive on-demand access. The 2018 season should be one for the records books. Will Eli Tomac defend his title? How will Ken Roczen do in his return? Can Zach Osborne repeat in the 250 class? What about Blake Baggett? All of these question and more will be answered soon. Sign up now to make sure you don’t miss a single minute of racing. MORGANTOWN, W. Va. (May 2, 2018) – In just 17 days the gate will drop on the 2018 Lucas Oil Pro Motocross Championship, sanctioned by AMA Pro Racing, and today MX Sports Pro Racing and NBC Sports Group jointly announced programming details for the upcoming season. The world’s most prestigious off-road motorcycle racing championship will remain a fixture on NBC, NBC Sports Network (NBCSN), and MAVTV this summer, highlighted by 36 hours of live coverage and more than 70 total hours of Pro Motocross content via broadcast and digital platforms. 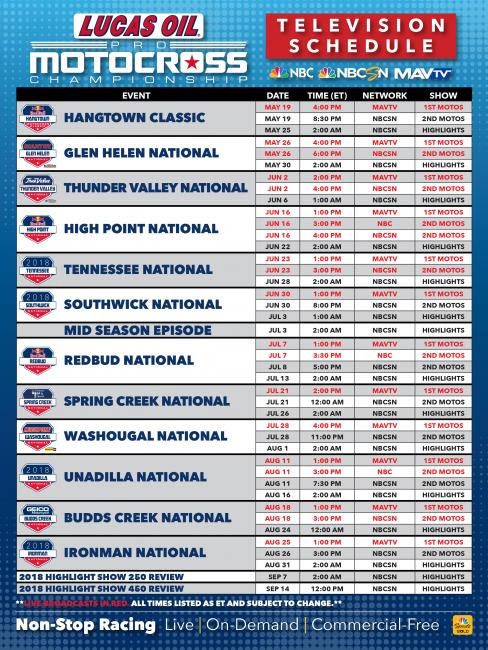 The centerpiece of the broadcast schedule for the 2018 season is a trio of special live network television telecasts on NBC, where the final 450 Class motos from the Red Bull High Point National (June 16), the Red Bull RedBud National (July 7), and the Unadilla National will be showcased to millions of homes across the country. Live coverage of the opening 450 Class and 250 Class motos from all 12 rounds of the season will be featured on MAVTV, which continues its growth by providing HD broadcast feeds to most subscribers, while NBCSN will carry live second moto coverage from five rounds of the championship. Digitally, fans can take the Lucas Oil Pro Motocross Championship anywhere they go with the one-of-a-kind “Pro Motocross Pass,” which returns to NBC Sports Gold with exclusive on-demand access of the Nationals. For just $54.99, motocross enthusiasts from around the world will receive live, commercial-free coverage from every round of the season, with the ability to watch timed qualifying and every moto unfold in real time. Additionally, full event replays from the 2016 and 2017 seasons, along with completed rounds of the 2018 season, are available for on-demand consumption. This unparalleled level of access to the championship breaks down to less than $5 per round over the course of the season! The on-air broadcast team bringing the Lucas Oil Pro Motocross Championship into households around the world will continue to be hosted by Jason Weigandt (@jasonygant), who will also handle play-by-play duties whenever bikes are on track, alongside former series champion Grant Langston (@grantlangston8), who will serve as the color analyst. The newest member of team is Will Christien (@willchristien), a veteran on-air personality from the world of action sports and racing who will get her first taste of American motocross as trackside correspondent, bringing all the breaking news and insider info from the pits. The 2018 Lucas Oil Pro Motocross Championship will kick off on Saturday, May 19, with the Red Bull Hangtown Motocross Classic from Prairie City SVRA in Sacramento, California. Click HERE to download and print the TV Schedule graphic.